This Sunday, 1st April, 2-5pm. Come and join the fun, meet the pigs, buy some Community Shares!!! First day's work in the new Maincrop Field. 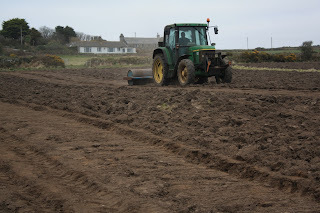 Clive rolling the newly ploughed field last week. After the three stages of preparation, the beds were marked out using our "new" vintage tractor, to give beds of 1m wide separated by 30cm pathways. 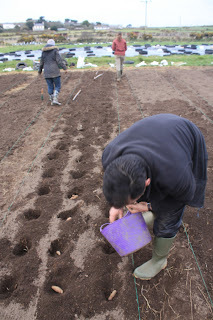 Today, thanks as always to our brilliant volunteers, we planted about 9000 "sturon" onion sets in the first eleven beds, and sowed double lines of "nantes" carrots between the onions of the first three beds. We aim to have planted the remaining 16 onion beds by the end of March , so please come along to our volunteering sessions and lend a hand! Tea, biscuits, and good company guaranteed! Steve, Terry, Anne and Natalie planting onion sets. On Saturday March 17th Bosavern Community Farm launched its community share issue offer at Cape Cornwall School in St. Just. 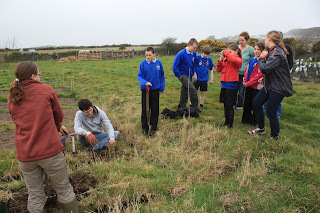 We are hoping to raise £125,000 towards securing the long term future of the farm as a community asset. Shares are available for the next two months only, costing £1 each, with the minimum purchase being 20 shares (£20) and the maximum 20,000 (£20,000). Please phone (01736) 788454 to order a prospectus, or visit www.bcfshares.org.uk to download a copy. Saturday's agenda displayed at the farm gate. Walking around the farm during the open morning. Some of the farm tour group inside one of our polytunnels. 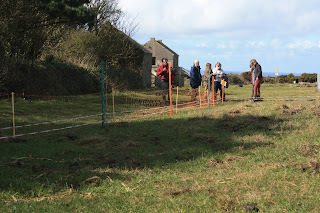 After showing several groups of people around the farm through the morning and afternoon, we moved on up to Cape Cornwall School for the launch event, where about 40 people came along to find out more, listen to people involved talk about the farm, and to buy the first shares. Deb Pepper, of the farm committee, explaining the role of the farm in the local community, and vice versa. Rob Pickering, of the farm committee, chatting to one of our neighbours. Andrew Corser, of the farm committee, taking questions about the shares. Thanks to Toby, a reporter for the Cornishman who volunteered for a day on the farm, we have a full page article in this weeks edition. Follow the above link to read the article, which has more photos than in the newspaper edition. There will be a jumble sale on Saturday 24th March in aid of the farm, 10am till 2pm in the WI Hall, St. Just. As well as jumble there will be a cake stall plus fresh organic eggs from the farm. Anybody wishing to donate jumble please bring it down to the farm, and put it in the room marked "JUMBLE" opening off the farmyard. See you on Saturday! 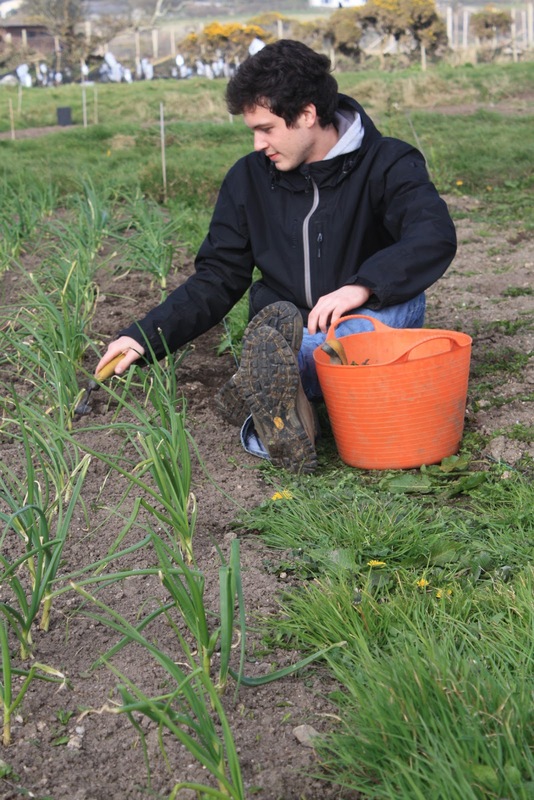 Thomas, from Paris, has just completed his week of volunteering through WWOOF on the farm, and will be heading to another farm near St. Erth. Thanks to Thomas for his hard work, and all the best for the rest of his stay in the UK. Thomas weeding the onion beds. Bosavern Community Farm today launched its Community Share Issue. More will follow on this blog at a later date. A new website to deal with the share offer is www.bcfshares.org.uk where all the information necessary to purchase shares in the farm can be found. 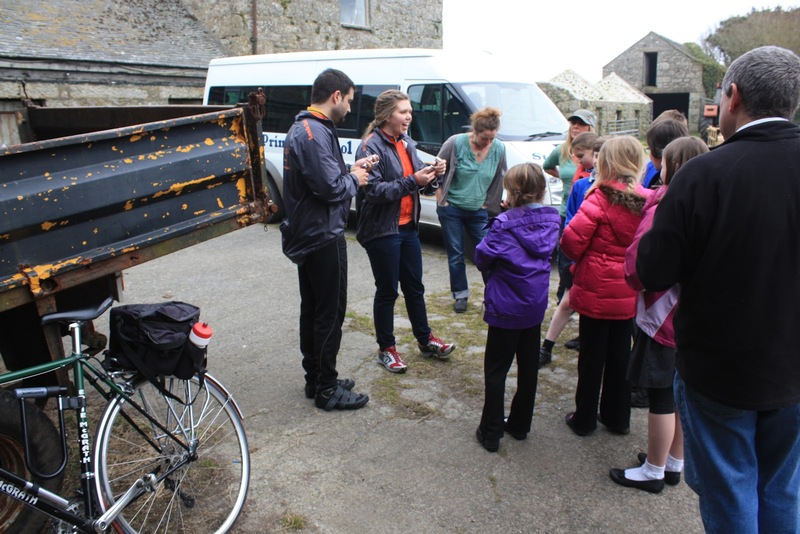 On Monday 12th March, Bosavern Community Farm was visited by Martin and Marika, who are cycling from Land's End to John O'Groats to raise money for Sustainability and Environmental EDucation (SEED), and visiting sustainability projects en-route. Being only 5 miles from Land's End we were their first point of call! 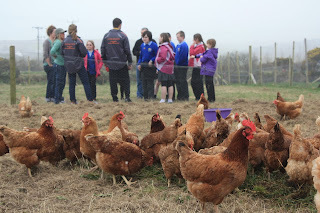 They cycled to the farm, and were joined by a group of students from St. Just Primary School to look around the farm and film each other talking about the project and what they were learning during Climate Change Week. 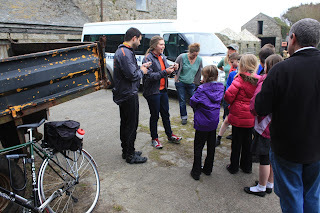 Martin and Marika meet St. Just primary school students in the farmyard. 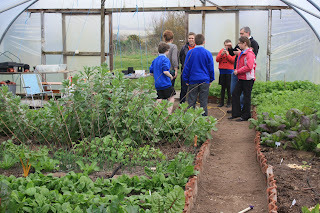 Filming in one of the polytunnels. Filming interviews with Natalie and Thomas (WWOOFers) on the vegetable field. 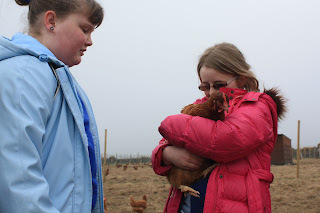 Meeting one of the tamer chickens. 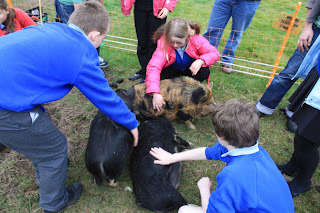 Meeting the kune kune pigs, who never tire of having their tummies tickled. We wish Martin and Marika all the best on their epic cycle journey. After their visit, the students returned to school, and the farm ran a stall selling fresh organic produce at the school gates as part of Climate Change Week. 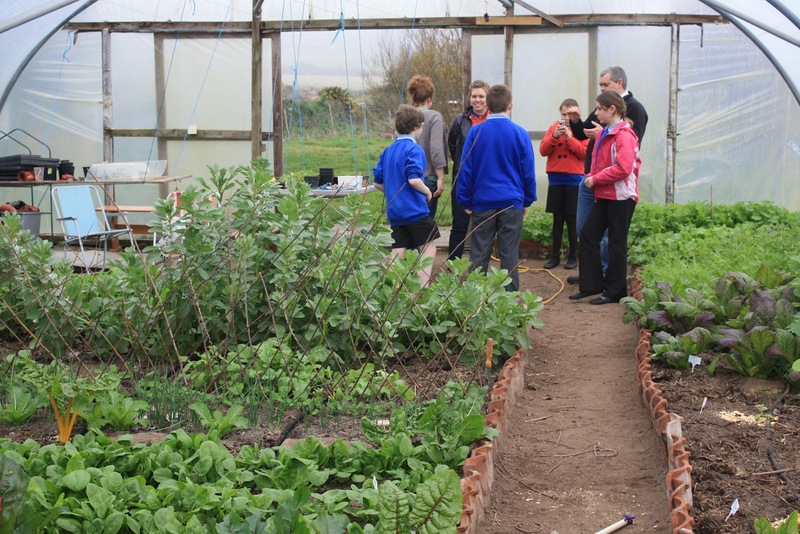 The schoolchildren had been learning about food miles, and the food from this farm traveled less than one mile to their school gate, underlining our commitment to fresh local organic affordable produce accessible to all. Many thanks to Maria from Italy who wwoofed on the farm for three days, and left yesterday morning. You made the digging go faster and we enjoyed the polenta too! 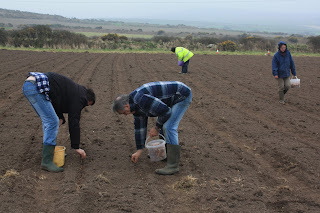 Planting the last of the new potatoes. 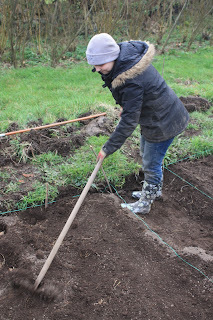 On Tuesday 6th we planted the final new potato in the market garden, so there are 20 beds planted with Maris Peer, Pink Fir Apple, and Charlotte. 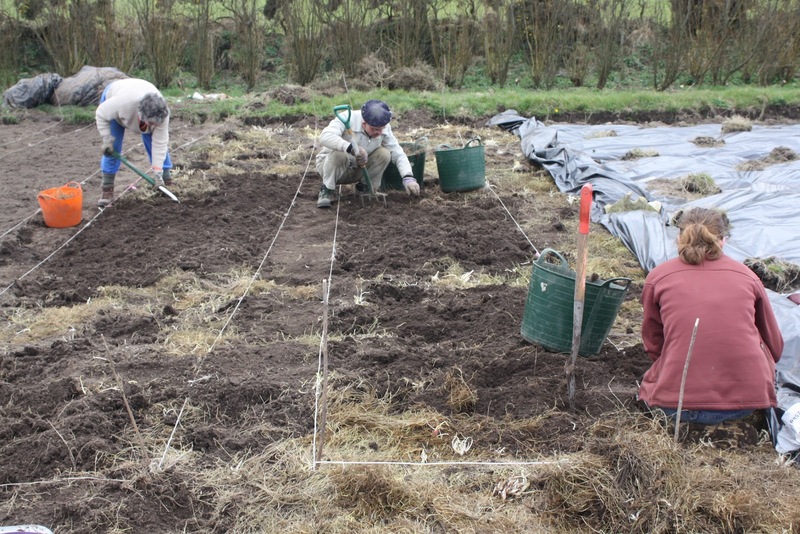 That's 240 square metres of potato beds prepared by hand by our dedicated team of volunteers. A cause for celebration! Preparing the final two beds. 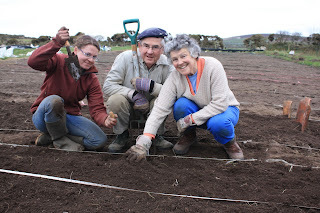 Natalie, Malcolm and Joan popping the final spud into its hole. 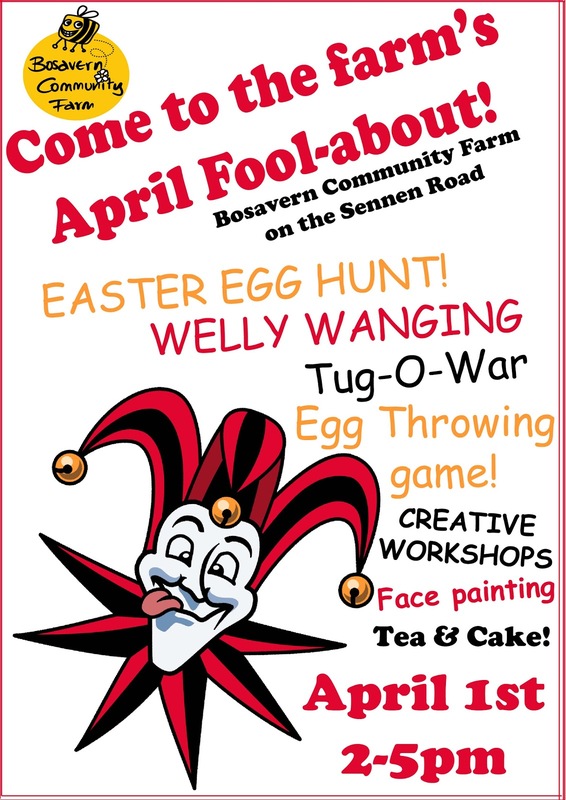 Saturday March 17th will be an exciting day in the life of Bosavern Community Farm, as we launch our community share offer. 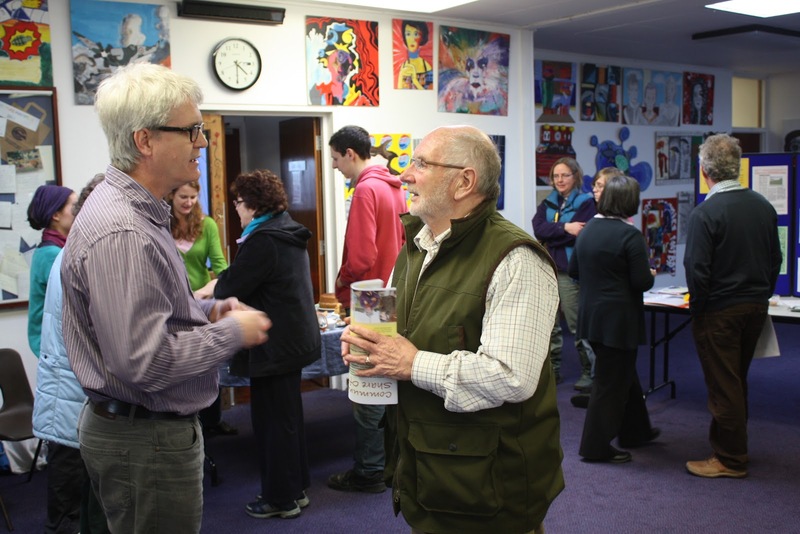 Community shares are a relatively new approach to raising financial support for not-for-profit social enterprises - investment from the public is intended to put the community farm on the road to a financially sustainable basis for the future. From 10:00 to 12:00 there will be an Open Morning at the farm, where anybody is free to call in to have a look around, a cup of tea and a chat. Please note that this Open Morning is at the farm NOT at Cape Cornwall School as reported in The Cornishman! 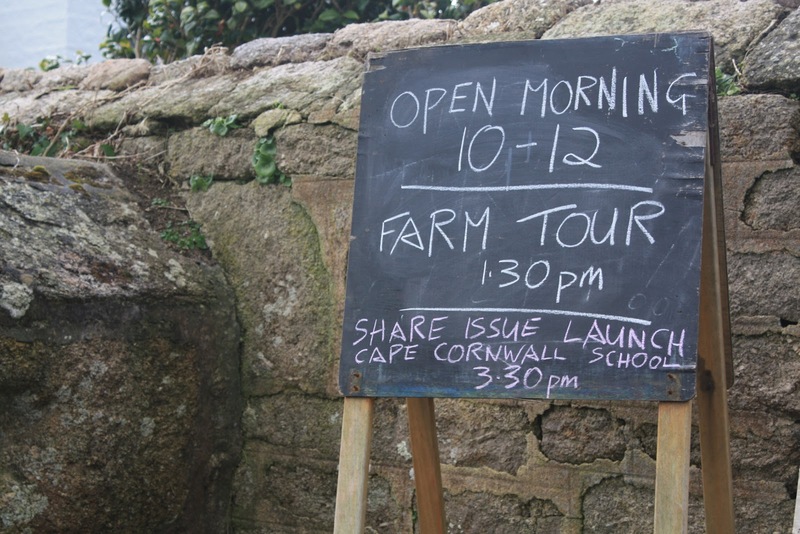 Minibuses will be leaving Cape Cornwall School at 13:30 for a guided tour of the farm, then returning to the school for the Share Launch reception at 15:30. Anybody wishing to find out more information, or to invest in the farm, please come along to these events and show your support for the project - everybody is invited. If you are unable to attend the launch, please visit www.bcfshares.org.uk from 17th March for full details of the offer and how to apply for shares. Bosavern Community Farm (BCF) invites you to the launch of its COMMUNITY SHARE OFFER on Saturday March 17th 2012: supporters and members of the public will have the chance to invest in this growing local food community enterprise in St Just. 10 am – 12 noon in the morning. Community Shares are a relatively new approach to raising financial support for not-for-profit, social enterprises like Bosavern Community Farm. This investment from the public is intended to put the community farm on the road to a financially sustainable future. Investors will become members of Bosavern Community Enterprises and be able to vote on Board members to run the project. It is hoped that some investors will want to get actively involved in the project, in some way, but this is not a requirement. 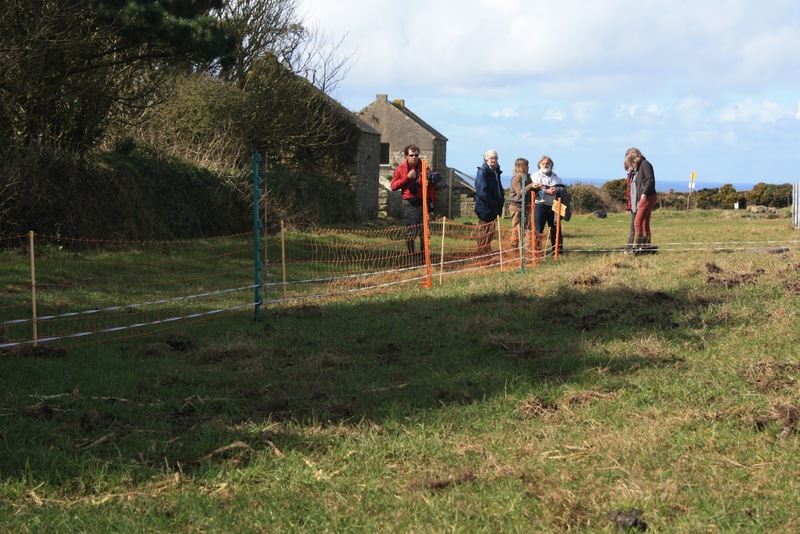 Currently, BCF is a pilot project of a local charity, Lands End Peninsula Community Land Trust (LEPCLT), at a Council owned farm just outside St Just. LEPCLT is committed to continuing the farm's long heritage as a training ground in agriculture. Cornwall Council now intends to sell this one remaining County-owned farm in Penwith and in order to prevent it from being sold on the open market (and lost as a community agricultural asset) LEPCLT now aims to buy the farm from the Council, and keep it in perpetuity on behalf of local people. We are progressing with our Lottery application but it will not provide 100% of the capital costs so we will still need other social investors, even if successful. 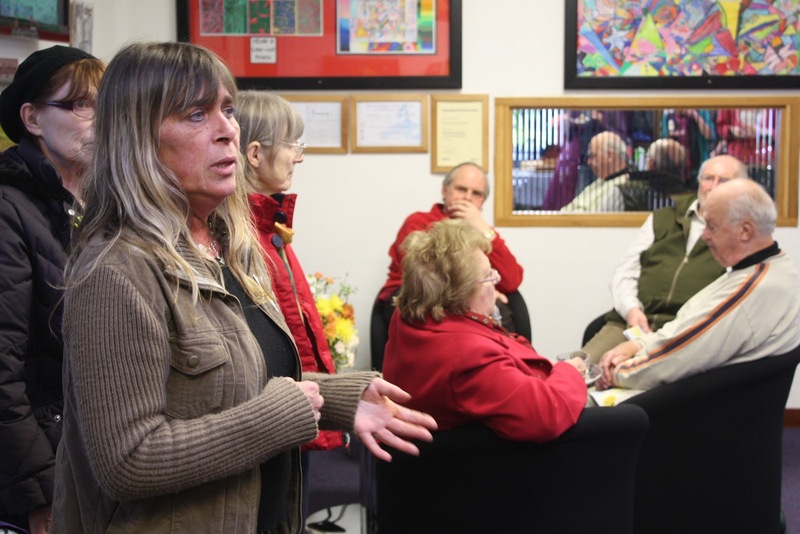 If, like us, you recognise and value the wider benefits of community investment in healthy living, increased social wealth, a more active local economy, useful and interesting training opportunities, and the many positive environmental bonuses, then these community shares may be for you! Come along to the launch to find out more......................... and bring a cheque book! 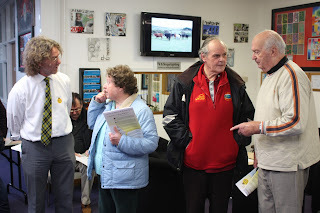 If you are unable to attend the launch, please visit www.bcfshares.org. uk from 17th March 2012 for full details of the offer and how to apply for shares. 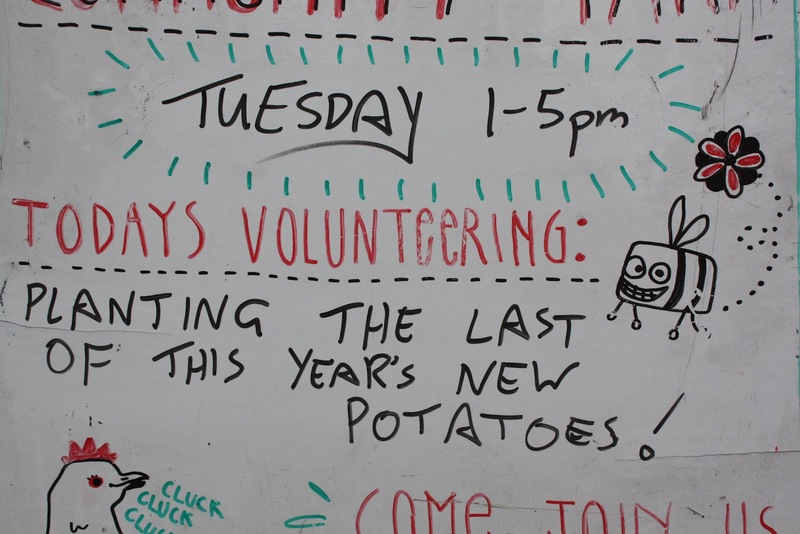 Drop in to any of the volunteer sessions to get involved in sowing a range of veg, preparing new growing beds, harvesting veg for veg boxes and Farmer’s Markets, caring for our chickens and pigs or even some ploughing. 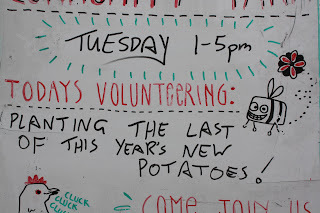 Volunteer sessions are Tuesday and Saturday 1 until 5 p.m. and Thursday 10 a.m. until 3 p.m. If you have not met our latest pigs then you must come and see them (they starred on the front of Outreach magazine last month) and are very cute. If you could help at another time then ring Hugh on the office number under contacts. 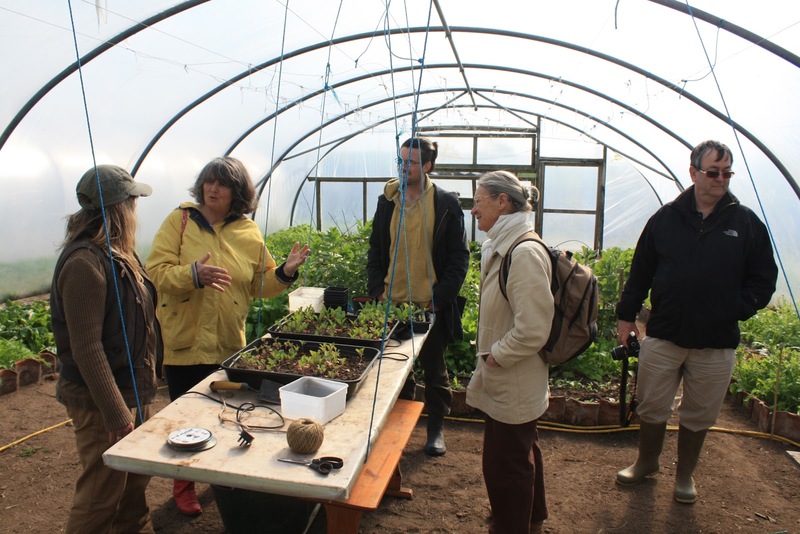 Members of the Lizard Onions group, who hope to set up a Community Supported Agriculture scheme on the Lizard Peninsula (find their facebook page for more information) visited Bosavern Community Farm on Tuesday 28th February on a fact-finding mission. 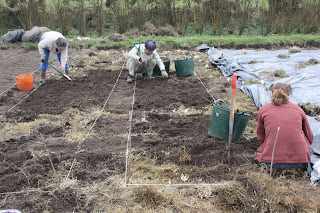 Luckily for us they wanted to get their hands dirty too, a quid pro quo of digging for information. 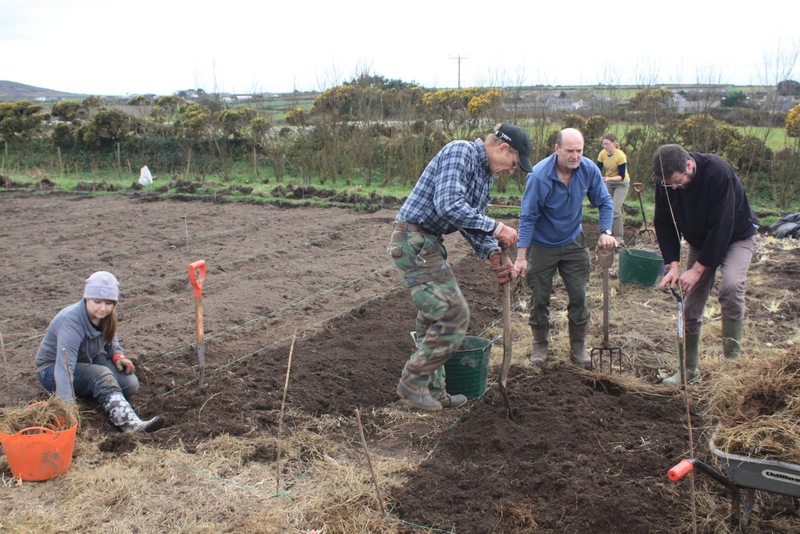 So they joined us on a regular volunteer session, being day 4 of planting new potatoes on the market garden field. We now have 13 of the 20 planned beds prepared and sown with seed potatoes - this year we are growing Maris Peer and Pink Fir Apple. Lizard Onions join wwoofers and local volunteers preparing potato beds. 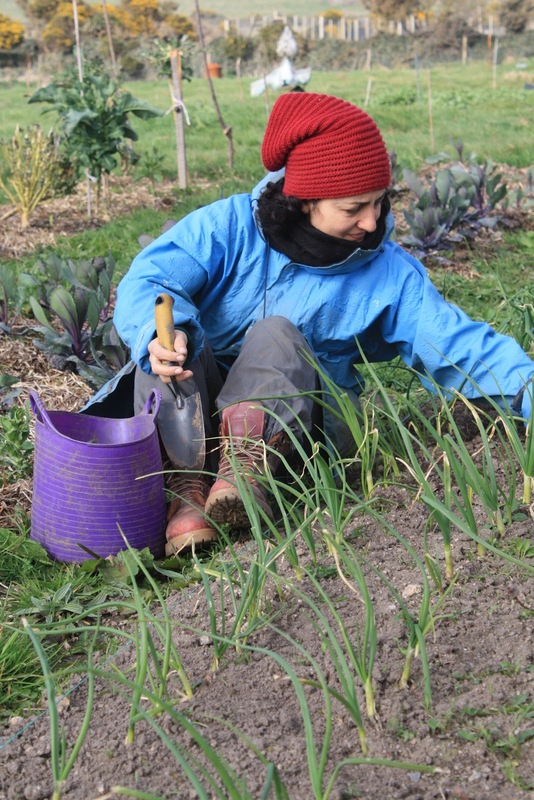 We wish the Lizard Onions every success with their adventures in community food production and if we can help further please feel free to get in touch. Nicole, from Dresden, who wwoofed on the community farm for one week, left for her next wwoofing assignment on Thursday morning. 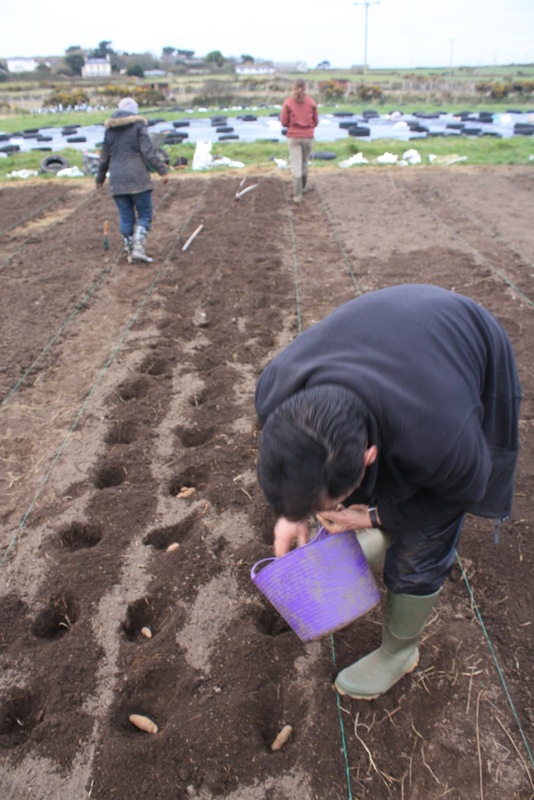 Many thanks for your hard work, especially in tackling the couch roots in the new potato beds! Nicole raking a new potato bed. Blue Horyzons, Hedluv and Passman. There are two gigs coming up in the Old Town Hall, St. Just, and the proceeds from the bar for both gigs is going to the farm, so please come along and have a drink or three (soft or otherwise) and support us! Blue Horyzons, a superb Bluegrass band from Penzance, are playing on Saturday 3rd March at 7:30pm; Hedluv and Passman, the Redruth Rappers (one of the funniest shows I've ever seen), will cause us to melt with mirth on Saturday 10th March also at 7:30pm. Great shows, great cause.